We guarantee sparkling windows for your home by seasoned professionals at the most affordable price. Removes Smudges & Indoor Pollutants. All Technicians Bonded & Insured. Trying to get rid of dirty windows? That’s not new. It is every homeowner’s story to get streak-free windows, but doing that themselves become absolutely difficult and time consuming too. You must have even tried vinegar, ammonia and paper towels, and other such at-home cleaning tips. And it still won’t go away? Let the professional unburden your worries of streak-free windows. 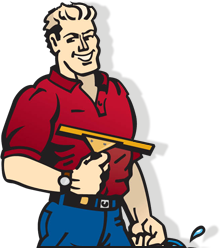 Here at Ortega Window Cleaning, we use only the best window cleaning tools and products that will leave you with clean sparkling windows to last for a long time. A squeegee, soap and water is used to wipe the glass. In case of paint and stubborn spots, we use razor blades for its removal. After squeegeeing, all the window’s edges and sills are wiped clean and dry with a cloth. Soft bristle brush is used for screen cleaning. Soaping and scrubbing is implemented only when it is particularly dirty. Why Choose Ortega Window Cleaning? With a thorough background and security check, each of our cleaning professional is issued a photo ID badge. We guarantee you a Streak-Free Windows topped with 48 Hour Rain Guarantee. Our window cleaning service is efficient and cost-effective. You can always avail our regular window cleaning service to maintain your property whole year round. Looking for a pricing estimate for your house in San Diego County? Simply fill in our ‘Request An Estimate’ form and get a FREE estimate. 138 Diana St. Encinitas, CA 92024.